If you have any information on this book, especially if you have a photo of the cover, please let us know. I’ve never seen this available for purchase, and I’ve been searching for several years. 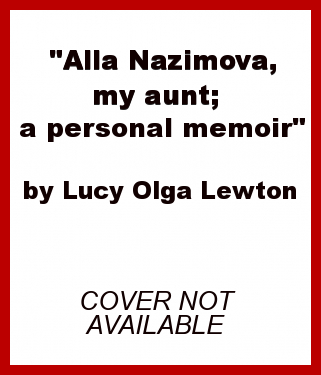 It’s sure to be a strange little book, since in the last years of her life Nazimova cut off nearly all contact with the Lewtons over Lucy’s ill-treatment of Glesca Marshall, Nazimova’s partner at the time. I’m in the midst of researching Glesca’s life, so if anyone has any information about her they’d like to share, please consider contacting me!